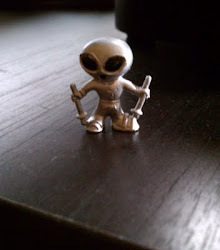 High Strangeness: The UFO Siege! Consider this: last September I spotted a 1977-vintage paperback UFO book called "Situation Red, the UFO Siege" at a rummage sale ('They Will Not Leave Me Alone," 9/26/2010). For 25 cents it seemed like a good buy, and the Cincinnati Enquirer called it "Fascinating!" so what the hell? I bought it. 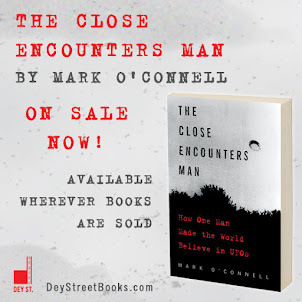 Unfortunately, once I started reading it I decided it was way too old school UFO for me -- too much "Why does the Air Force fear disclosure of the truth?" and all that -- so I put it on the bookshelf, wrote an angry letter to the Cincinnati Enquirer, and then forgot about it. 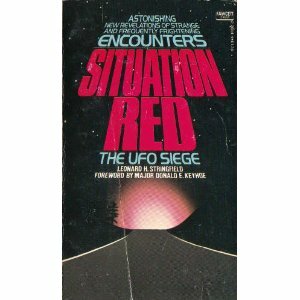 Until last week, when I was at the Chicago MUFON meeting, and one of the guest presenters mentioned that there was this great old UFO book out there that we should all read, and it was called "Situation Red, the UFO Siege." You could have knocked me over with a coincidence. That beat-up old 25-cent paperback on my bookshelf is worth reading? Who knew? Now, most of us have had the experience where time seems to stand still on a pleasant summer day, sometimes for as much as ten minutes... but most of us have never lived in Germany in 1939, either, and maybe time stands still differently when there's a Nazi secret weapon aimed at your city... It's worth considering. Yes, yes, I know that's not a UFO occurrence, per se, but it does make you wonder where the Germans got the idea for their freeze ray... and I'm talking "where?" as in "which planet?"